Nigerian media personality Toke Makinwa and her fitness expert beau Maje Ayida are MARRIED! 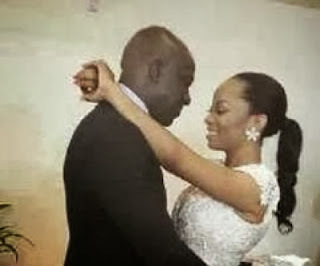 After dating on and off for over a decade, media personality Toke Makinwa and Maje Ayida have finally settled down. The longtime lovebirds got married quietly on Wednesday, January 15th at a registry in Lagos, with only a few family members and friends in attendance. We wish the couple a blissful marriage and pray their home is filled with nothing, but love, peace, and harmony. Check out Toke Makinwa and Maje Ayida's weddin photos. What a beautiful couple! Congratulations to them, but 12 years is a long time to wait for that oruka o. The two of them look very good together and her dress is very beautiful.